Goldman Sachs has admitted that it had insured roughly $20 billion worth of subprime collateralized debt obligations (CDOs) linked to the performance of certain mortgages with AIG. Timothy Geithner, when he was running New York Federal Reserve, never revealed the critical fact that Goldman didn’t merely buy insurance on a bunch of “random” subprime CDOs. Goldman actually bought insurance on special CDOs that it had put together for its own clients. Goldman, with full knowledge, bought insurance on these CDOs because it knew they’d collapse. This is like selling a car with a bomb in it to your client while you take out life insurance on his life. You know he is going to die, and that you are going to collect on his life insurance. It was win-win for Goldman, as they make out on the commissions of selling CDOs to their clients, and get paid again when the CDOs go bust. These facts which were discovered by the office of Darrell Issa, the ranking Republican on the House Committee on Oversight and Government Reform. This will certainly lead to a full investigation of the Goldman-AIG dealings and the subsequent $180 billion bailout led by Tim Geithner’s New York Federal Reserve. John Paulson, through his company, Paulson & Co., designed these CDOs, and was betting against them at the same time. Paulson worked with Goldman to pick a group of mortgages most likely to be downgraded. Don’t confuse John Paulson with former U.S. Treasury Secretary Hank Paulson. Hank was the guy who gave YOUR billions to his old firm, Goldman Sachs. Paulson & Co then paid Goldman $15 million for the service selling the toxic CDOs to its clients. Yes, Goldman sold these toxic CDOs to its clients, who readily bought because of their triple-A rating. John Paulson made $1 billion from his bets against this particular mortgage product, named Abacus. The buyers, which included ACA Financial and the German bank IKB, lost $1 billion. The SEC’s lawsuit states that these mortgage securities were fraudulently constructed – they were made to fail. 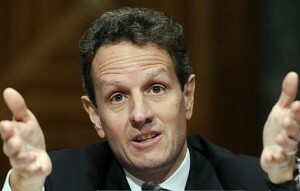 Good work by John Paulson and tax cheat Timothy Geithner, who provided cover for the operation. Former President Clinton warns us not to “demonize” our public officials – it might lead to violence against the powers that be. Aw, really? If you don’t believe in violence, you don’t believe in the American Revolution.